When it comes to salt, less is better. Even though it’s an essential component of our diet which we see the salt is always present naturally in various foods. 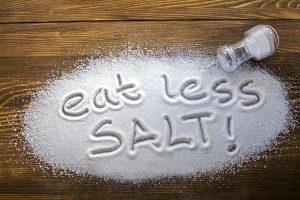 Cutting down the salt beyond doubts helps in controlling blood pressure, cardiac ailments. Begin reading food labels as a matter of course. Sodium content is always listed on the label. Sometimes the high sugar content in a product like an apple pie can mask the high sodium content so it's important to check every label for sodium content. Compare various brands of the same food item until you find the one that has the lowest sodium content since this will vary from brand to brand. If you have elevated blood pressure, dietary sodium restriction can not only lower your blood pressure but can enhance your response to blood pressure medications. Older PostSmartphone : is it a health menace..!! !